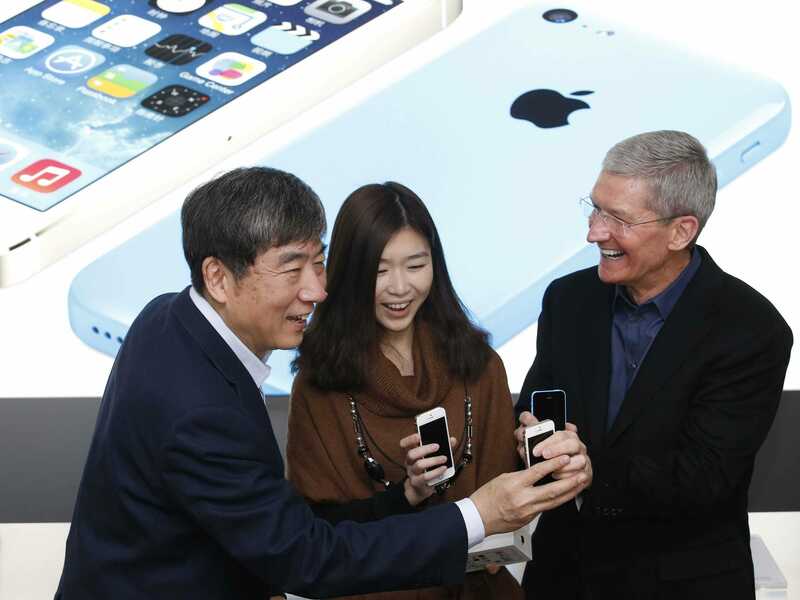 Kim Kyung Hoon/ReutersApple Inc. CEO Tim Cook (R) and China Mobile’s Chairman Xi Guohua (L) with iPhones pose with a customer at an event celebrating the launch of Apple’s iPhone on China Mobile’s network at a China Mobile shop in Beijing January 17, 2014. For the first time since 2012, Apple has overtaken Samsung to become the top mobile brand in China. According to a new report from the China Brand Research Center, Apple now scores the highest for both brand awareness and loyalty in China, reports CNET. Each year, the China Brand Research Center conducts an extensive survey to determine the rankings of its China Brand Power Index, and this year’s rankings polled some 13,500 Chinese across 30 cities, from the ages of 15 to 60. Samsung has held the top spot since 2012, but was overtaken by Apple due to Samsung’s slipping focus on consumer loyalty as the Korean-based smartphone maker instead largely focused on market share, according to the report. “If companies [are] focusing too much on market share, while ignoring the concerns of consumers, it will cause a problem in brand management,” the Chinese Brand Research Center said. While Samsung did increase its score in the rankings from 542 to 566.6 points, Apple managed to squeeze past with a score of 568.5 to claim the No. 1 spot. Apple has been increasingly focused on China in the past two years, with Apple CEO Tim Cook making multiple trips to the country and voicing his intent for the world’s largest market to become Apple’s largest market as well. “China is currently our second-largest market, I believe it will become our first,” Tim Cook told the Xinhau News Agency back in January 2013. To expedite this effort, Apple is currently planning to open 25 new Apple stores in China throughout the next two years.